The monthly Moving Forward is published with support from Jews Say No! That organization engages in community education, street theatre, and organizing to make their members’ voices heard in Jewish communities and as partners in the broader movement for justice in Palestine/Israel. The following article is the editorial to Moving Forward’s special issue on the 70th anniversary of the Nakba. We present this special issue of Moving Forward to commemorate the 70th anniversary of the Nakba, the Arabic word for ‘catastrophe.’ The Nakba refers to the expulsion and dispossession of 750,000 Palestinians from their homeland during Israel’s creation (1947–1949). To Moving Forward readers: Please note that the articles in this special issue of Moving Forward were originally published between 2005 and 2018 and that text written in the present tense refers to events that occurred at the time of publication. 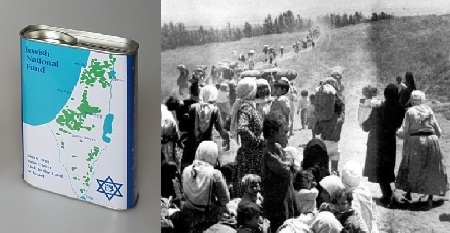 Photo: “…and it begins with that icon of innocence, the JNF’s small blue metal box that many of our readers will remember from their childhood, boxes that beckoned us to drop in coins that would help `make the desert bloom’ and build the land of Israel.” Source: Moving Forward.